Use fresh peppers from your garden or the farmers' market to make these. 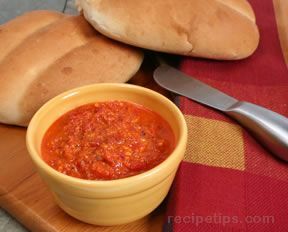 The filling mixed with the peppers and the tomato sauce is delicious. Serve with some crusty bread for a meal. Leftovers can easily be frozen. Bring a large pot of water to a boil. Cut the tops off the peppers, remove the seeds and rinse. Cook peppers in boiling water for 5 minutes; drain. 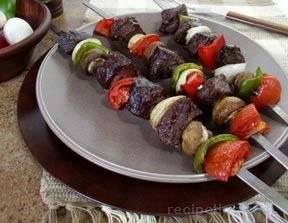 Sprinkle salt inside each pepper, and set upside-down on paper towels to cool. In a large skillet, saute ground beef and onions until beef is no longer pink. Drain off excess fat. Season with salt and pepper. Stir in the diced tomatoes, tomato sauce, rice and Worcestershire sauce. Cover and simmer for 15 minutes, or until rice is tender. Remove from heat. Stir in basil. 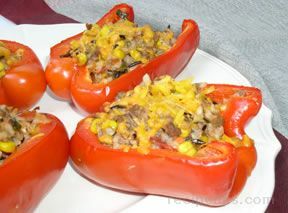 Stuff each pepper with the beef and rice mixture, and place peppers in a baking dish. Top with cheese. Pour crushed tomatoes over the top. Salt & pepper, to taste. Bake covered for 35 to 45 minutes, until heated through.